The guide will explain to you, in his blood-curdling way, how he saw the little steamer, Maid of the Mist, descend the fearful rapids--how first one paddle-box was out of sight behind the raging billows and then the other, and at what point it was that her smokestack toppled overboard, and where her planking began to break and part asunder--and how she did finally live through the trip, after accomplishing the incredible feat of traveling seventeen miles in six minutes, or six miles in seventeen minutes, I have really forgotten which. But it was very extraordinary, anyhow. It is worth the price of admission to hear the guide tell the story nine times in succession to different parties, and never miss a word or alter a sentence or a gesture. Any day, in the hands of these photographers, you may see stately pictures of papa and mamma, Johnny and Bub and Sis or a couple of country cousins, all smiling vacantly, and all disposed in studied and uncomfortable attitudes in their carriage, and all looming up in their awe-inspiring imbecility before the snubbed and diminished presentment of that majestic presence whose ministering spirits are the rainbows, whose voice is the thunder, whose awful front is veiled in clouds, who was monarch here dead and forgotten ages before this hackful of small reptiles was deemed temporarily necessary to fill a crack in the world's unnoted myriads, and will still be monarch here ages and decades of ages after they shall have gathered themselves to their blood-relations, the other worms, and been mingled with the unremembering dust. 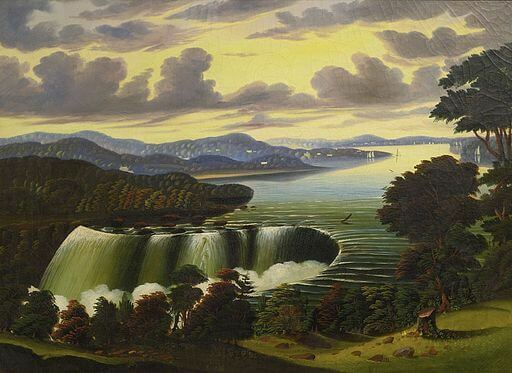 There is no actual harm in making Niagara a background whereon to display one's marvelous insignificance in a good strong light, but it requires a sort of superhuman self-complacency to enable one to do it. When you have examined the stupendous Horseshoe Fall till you are satisfied you cannot improve on it, you return to America by the new Suspension Bridge, and follow up the bank to where they exhibit the Cave of the Winds. We now began to creep along flimsy bridges of a single plank, our persons shielded from destruction by a crazy wooden railing, to which I clung with both hands--not because I was afraid, but because I wanted to. Presently the descent became steeper and the bridge flimsier, and sprays from the American Fall began to rain down on us in fast increasing sheets that soon became blinding, and after that our progress was mostly in the nature of groping. Nova a furious wind began to rush out from behind the waterfall, which seemed determined to sweep us from the bridge, and scatter us on the rocks and among the torrents below. I remarked that I wanted to go home; but it was too late. We were almost under the monstrous wall of water thundering down from above, and speech was in vain in the midst of such a pitiless crash of sound. In another moment the guide disappeared behind the deluge, and bewildered by the thunder, driven helplessly by the wind, and smitten by the arrowy tempest of rain, I followed. All was darkness. Such a mad storming, roaring, and bellowing of warring wind and water never crazed my ears before. I bent my head, and seemed to receive the Atlantic on my back. The world seemed going to destruction. I could not see anything, the flood poured down savagely. I raised my head, with open mouth, and the most of the American cataract went down my throat. If I had sprung a leak now I had been lost. And at this moment I discovered that the bridge had ceased, and we must trust for a foothold to the slippery and precipitous rocks. I never was so scared before and survived it. But we got through at last, and emerged into the open day, where we could stand in front of the laced and frothy and seething world of descending water, and look at it. When I saw how much of it there was, and how fearfully in earnest it was, I was sorry I had gone behind it. The noble Red Man has always been a friend and darling of mine. I love to read about him in tales and legends and romances. I love to read of his inspired sagacity, and his love of the wild free life of mountain and forest, and his general nobility of character, and his stately metaphorical manner of speech, and his chivalrous love for the dusky maiden, and the picturesque pomp of his dress and accoutrements. Especially the picturesque pomp of his dress and accoutrements. When I found the shops at Niagara Falls full of dainty Indian beadwork, and stunning moccasins, and equally stunning toy figures representing human beings who carried their weapons in holes bored through their arms and bodies, and had feet shaped like a pie, I was filled with emotion. I knew that now, at last, I was going to come face to face with the noble Red Man. "Is the Wawhoo-Wang-Wang of the Whack-a-Whack happy? Does the great Speckled Thunder sigh for the war-path, or is his heart contented with dreaming of the dusky maiden, the Pride of the Forest? Does the mighty Sachem yearn to drink the blood of his enemies, or is he satisfied to make bead reticules for the pappooses of the paleface? Speak, sublime relic of bygone grandeur--venerable ruin, speak!" "An' is it mesilf, Dennis Hooligan, that ye'd be takon' for a dirty Injin, ye drawlin', lantern-jawed, spider-legged divil! By the piper that played before Moses, I'll ate ye!" "Is the heart of the forest maiden heavy? Is the Laughing Tadpole lonely? Does she mourn over the extinguished council-fires of her race, and the vanished glory of her ancestors? Or does her sad spirit wander afar toward the hunting-grounds whither her brave Gobbler-of-the- Lightnings is gone? Why is my daughter silent? Has she ought against the paleface stranger?" "Faix, an' is it Biddy Malone ye dare to be callin' names? Lave this, or I'll shy your lean carcass over the cataract, ye sniveling blaggard!" "Confound these Indians!" I said. "They told me they were tame; but, if appearances go for anything, I should say they were all on the warpath." "Noble Red Men, Braves, Grand Sachems, War Chiefs, Squaws, and High Muck- a-Mucks, the paleface from the land of the setting sun greets you! You, Beneficent Polecat--you, Devourer of Mountains--you, Roaring Thundergust --you, Bully Boy with a Glass eye--the paleface from beyond the great waters greets you all! War and pestilence have thinned your ranks and destroyed your once proud nation. Poker and seven-up, and a vain modern expense for soap, unknown to your glorious ancestors, have depleted your purses. Appropriating, in your simplicity, the property of others has gotten you into trouble. Misrepresenting facts, in your simple innocence, has damaged your reputation with the soulless usurper. Trading for forty-rod whisky, to enable you to get drunk and happy and tomahawk your families, has played the everlasting mischief with the picturesque pomp of your dress, and here you are, in the broad light of the nineteenth century, gotten up like the ragtag and bobtail of the purlieus of New York. For shame! Remember your ancestors! Recall their mighty deeds! Remember Uncas!--and Red jacket! and Hole in the Day!-- and Whoopdedoodledo! Emulate their achievements! Unfurl yourselves under my banner, noble savages, illustrious guttersnipes--"
"Down wid him!" "Scoop the blaggard!" "Burn him!" "Bang him!" "Dhround him!" It was the quickest operation that ever was. I simply saw a sudden flash in the air of clubs, brickbats, fists, bead-baskets, and moccasins--a single flash, and they all appeared to hit me at once, and no two of them in the same place. In the next instant the entire tribe was upon me. They tore half the clothes off me; they broke my arms and legs; they gave me a thump that dented the top of my head till it would hold coffee like a saucer; and, to crown their disgraceful proceedings and add insult to injury, they threw me over the Niagara Falls, and I got wet. About ninety or a hundred feet from the top, the remains of my vest caught on a projecting rock, and I was almost drowned before I could get loose. I finally fell, and brought up in a world of white foam at the foot of the Fall, whose celled and bubbly masses towered up several inches above my head. Of course I got into the eddy. I sailed round and round in it forty-four times--chasing a chip and gaining on it--each round trip a half-mile--reaching for the same bush on the bank forty-four times, and just exactly missing it by a hair's-breadth every time. "Excuse the seemingly impertinent curiosity of a drowning man, but will you explain this singular conduct of yours?" "With pleasure. I am the coroner. Don't hurry on my account. I can wait for you. But I wish I had a match." He declined. This lack of confidence on his part created a coldness between us, and from that time forward I avoided him. It was my idea, in case anything happened to me, to so time the occurrence as to throw my custom into the hands of the opposition coroner on the American side. At last a policeman came along, and arrested me for disturbing the peace by yelling at people on shore for help. The judge fined me, but had the advantage of him. My money was with my pantaloons, and my pantaloons were with the Indians. Thus I escaped. I am now lying in a very critical condition. At least I am lying anyway---critical or not critical. I am hurt all over, but I cannot tell the full extent yet, because the doctor is not done taking inventory. He will make out my manifest this evening. However, thus far he thinks only sixteen of my wounds are fatal. I don't mind the others. "It is an awful savage tribe of Indians that do the beadwork and moccasins for Niagara Falls, doctor. Where are they from?" Add Niagara to your own personal library.